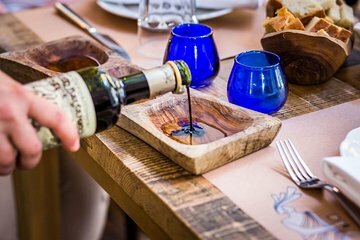 Aprende sobre el aceite de oliva croata y el vino zinfandel. Terminar con café y tarta. Conozca el patrimonio culinario de la región de Dalmacia y disfrute de generosas muestras de productos locales, desde aceite de oliva hasta queso, en este tour para grupos pequeños. Además, aproveche la atención personalizada de un guía profesional en todo momento. We visited Split an had an amazing experience with Maja. She gave us so much history during our tour. We felt a personal connection with her because there was only my husband and I that booked the tour. Sitting and chatting about the city with a local was a great way to end the tour. By the end of our tour she felt more like a friend than a tour guide. I highly recommend this tour. BEST TOUR WE WENT ON DURING OUR TIME IN CROATIA. Our guide Maja was perfect! She educated us about the city of Split and the history of the palace. Its clear she loves this city by her enthusiasm to share with her guests. She taught us so much about the history, the architecture, and gave us great recommendations of where to eat. The food and wine tastings on this tour where excellent with very knowledgeable hosts who are excited to share their food and traditions. We left this tour so excited to explore more! Maja was an interesting and extremely knowledgeable host. We toured the Palace, heard about the history of Split, tasted olive oil, wine and scrumptious bites. This was great! Ending up being a private tour. The guide was an archaeologist, so she had great insight into the amazing history of Split. We got some traditional food at the street market that I would never have chosen, but it was excellent. The olive oil and wine tastings were very good, and we topped it off with a traditional dessert. There would have been more, but I had to cut it short. It didn't matter -- well worth it! My tour was with Maja, a local archeologist. Having a knowledgable local made the experience great. This is not just eating and drinking (great) stuff, but I learned a ton, which I appreciated. I would recommend this tour to anyone as long as you like history. We were a small group of four people. Our guide, Maja, was incredibly knowledgable. She read us very well and delivered her information at a level that was appropriate for her audience. She allowed us to travel at our own pace but ensured that we were in the right places at the right time. 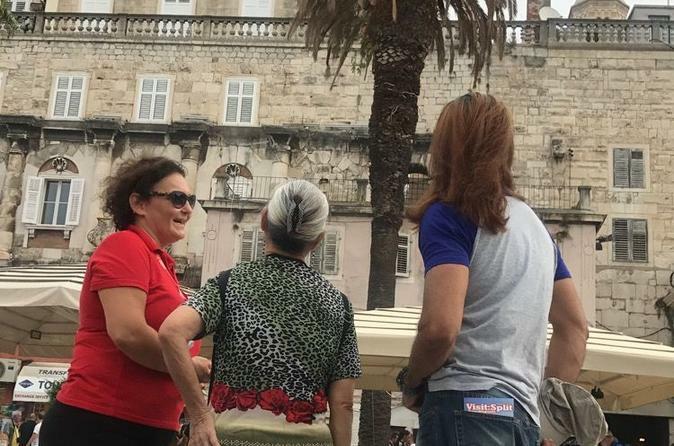 As well as the guided tour which covered the history of the area and gave an overview of the Diocletian Palace, there were three separate food and drink experiences. The olive oil tasting was conducted by another extremely knowledgable young lady as was the wine tasting. The locations for each of the tastings were friendly and welcoming and the tasting samples very generous. Unfortunately, due to over-indulging earlier on the tour, we were not able to do lunch justice. However, it was delicious consisting of freshly baked bread and local ham and cheese, dessert and coffee. Over lunch we were able to discuss the history of the area in much greater depth and Maja was a delightful lunch companion. We would like to highly recommend this tour. What an informative as well as and most importantly enjoyable experience that was. Maya is so knowledgeable and forthcoming with in-depth facts about the history of the palace and Croatia. It was truly amazing. For me this was so much better than doing a straight walking tour. I learnt things about olive oil that I didn't know in a pleasant environment, tasted some lovely wines with delicious accompaniments at a nice wine bar, and then finished with lunch at a restaurant. Therefore don't eat much for breakfast because you'll soon make up for it! I was on my own, but because it was such a small group five plus Maya it was easy to join in with the others. I highly recommend this tour or any tour that Maya is taking. Our guide Maja, was amazing. She was patient, knowledgeable and accommodating to me, my adult brother and my elderly mother. She was very pleasant throughout our tour, sharing extensive knowledge on the city, the surrounding areas and the rich history. Amazing tour of Split! Ivan our tour guide was very informative and great to talk too. It was only me and my wife which was alright with us. We had a very interesting tour with detailed information of the city and it’s past from Ivan. We also tasted olive oil at a local oil bar and wine at wine bar. Maja was a fabulous tour guide! Her depth of knowledge about Diocletian's Palace and the history of Split was extremely impressive and helpful. She took us to a wonderful olive oil tasting where we ended up having an unforgetable dinner a few nights later. She also took us to a wine tasting that taught us a great deal about Croatian wines. We topped it off with a lovely meal at a casual but top notch restaurant. The tour was overall one of the many highlights of our trip and we wished we had Maja to drag along with us for the rest of our stay in Split. This was money well spent and we are so glad we did this at the beginning of our trip. Thank you, Maja!! !